This is a joint post with Dalberg consultants Jerry Wang, Shyam Sundaram and Andria Thomas. 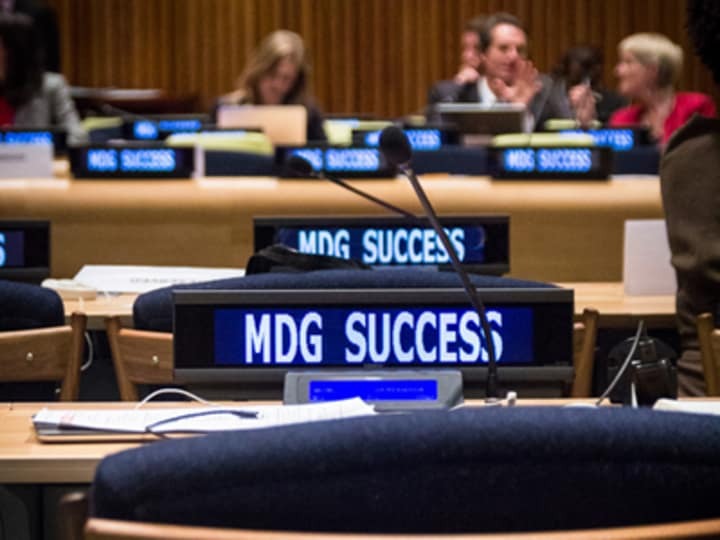 With about 750 days remaining until the Millennium Development Goals expire, the process to replace those goals with a new global development agenda is well underway, and various U.N. gatherings have featured discussions on updating these goals. But were they, in fact, successful? Answering that question is fundamental to ensuring that the current debates focus on the most important thing: how to make a real difference to the lives of the world’s poor. Most assessments of progress on the MDGs have set too high a bar, by asking if the extremely ambitious goals have been achieved in full (they haven’t), or too low a bar, by asking if progress has been made towards the goals (it has). The right bar is to ask whether the rate of progress was in fact faster after the MDGs were created than it was before. Our analysis presents a mixed picture. 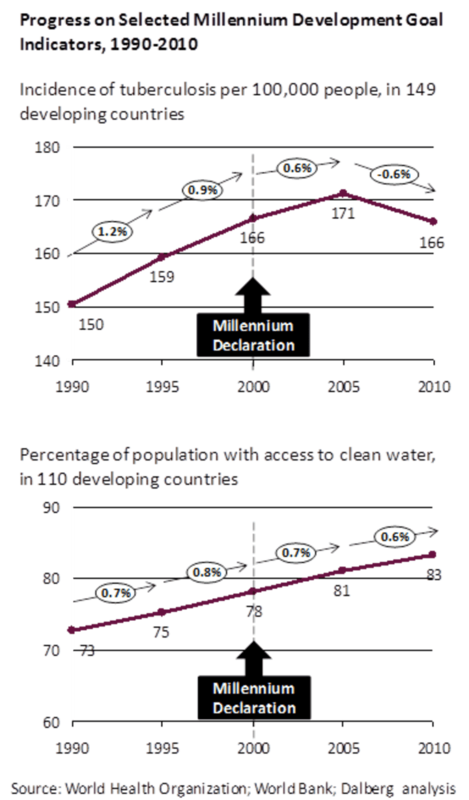 Prevalence of HIV and tuberculosis were both rising prior to the Millennium Declaration, and both are now declining rapidly. Rates of maternal mortality and of deaths of children under five both declined at faster rates between 2000 and 2010 than they had in the previous decade. However, on other important goals, such as undernourishment of children, completion of primary school, access to clean water and the share of urban populations living in slums, the MDGs have not resulted in a significant acceleration in progress towards the goals since the Millennium Declaration. These findings are corroborated by other researchers who find somewhat faster-than-expected progress on some — but only a minority — of the MDGs since 2000. What implications does the mixed effectiveness of the MDGs have for the ongoing debate on the post-2015 development agenda, and for foreign development assistance, whose growth accelerated dramatically following the Millennium Declaration, from 2 percent per year between 1980 and 2000 to 10 percent per year between 2000 and 2010? For some targets, the MDGs did make a difference, and consequently it is vitally important that an agreed agenda with clear goals exists after 2015. Thus, securing a political agreement between developed and developing countries for such an agenda is essential. The U.N. High-Level Panel’s report is an important step in this direction. But this should not be enough. Our research indicates that there is room to improve on the MDGs — to create a framework that is more effective. Creating a better framework must become central to the debate, not merely expanding the goals to include topics left out in 2000 or bringing more actors into the process. A better framework needs mechanisms to connect goals with decisions made and actions taken in capitals and communities around the world. Such mechanisms could be identified through rigorous and systematic study of what was done for those MDGs for which progress accelerated after 2000 and not done for those goals where the rate of progress stayed constant or declined — an investigation that has not happened to date. 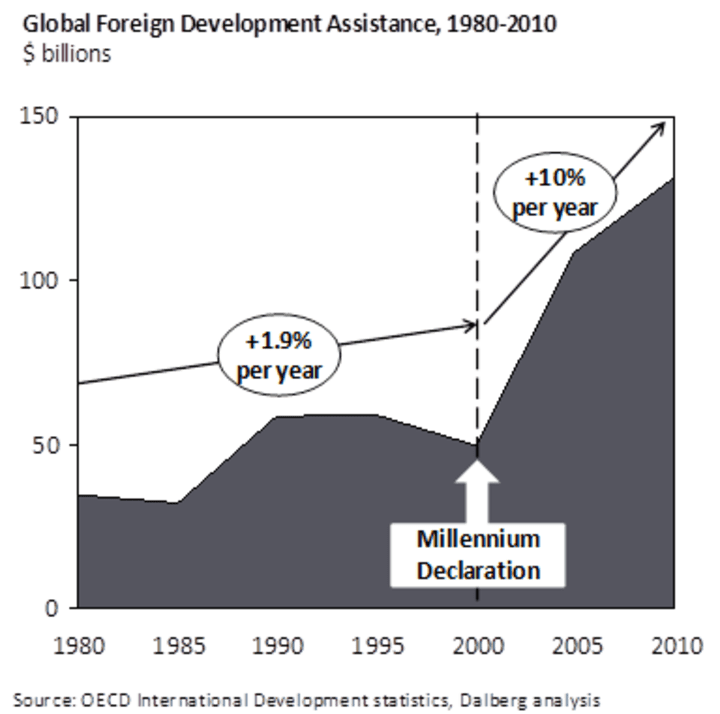 Mechanisms should drive decisions on domestic spending and not just foreign assistance, because domestic sources account for the majority of total government spending even in the least-developed countries of sub-Saharan Africa. Accountability mechanisms are likely to be crucial, as the U.N. High-Level Panel stressed in its report. In many countries, the MDGs haven’t even been measured; much published data is based on fewer than half of developing countries. Perhaps citizens could be enlisted to track goals at local levels: there is already evidence that public worker absenteeism can be reduced by monitoring attendance and that more public spending is used for intended purposes when citizens know about monies allocated for projects in their local communities. Perhaps leaders of developing countries could get performance pay based on achieving improvements in living standards for their citizens. Whatever mechanisms are put in place, aligning government actions with public interests will be essential. The world’s poor will come to the top of the international agenda in 2015. It is critical that this opportunity launch a global development framework that considers carefully the mixed results of the MDG goals and is based on a deliberate understanding of what causes success. Only then can we claim to have an agenda designed genuinely to bring forward the day when the world rids itself of extreme poverty. Paul Callan is Dalberg’s regional director of the Middle East and North Africa region, based in Abu Dhabi. He also co-leads Dalberg Advisors' Strategy and Performance practice area. Paul has provided advice on strategy, organizational development, design of new initiatives, and change management to many United Nations agencies, the World Bank, regional development banks, nongovernmental organizations, donors, and governments.